TSS is a GUI (graphic user interface) encoder, which means you don't have to do anything tricky on the command line. TSS can send out one or two streams with different settings, from the same video source. The video source can be digital video (DV) or analog video via a video capture device such as a webcam, USB video-in or video card with video-in. Bear in mind that a fast computer with at least 2gig ram will be required to stream to 2 targets without frame drops or loss of audio synchronisation. TSS can also display a preview of the outgoing stream, and can simultaneously archive the streams to disk (but that depends a little on how good your computer is). TSS simply takes the configuration you set in the GUI and creates the appropriate command line using these three softwares so you don't need to enter in complex commands manually. One can always copy the command line being used by TSS, it will be printed out on the status window, the small black space we can see above under the Execute and Stop buttons. Simply scroll your mouse pointer and select the text. You could then run this piped commands directly from command line, saving some resources by avoiding launch of the graphical system. TSS main developer is Lluis Gómez i Bigordà, the current release (February 2009) is 0.2. The project status is active (always good to know!). TSS can only be installed on GNU/Linux. We will look at installing TSS on Ubuntu. The option selected by default is what we want to use. 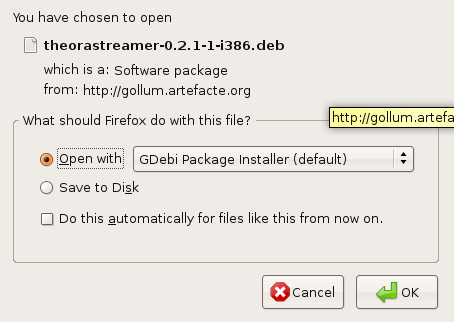 If we open the installer with GDebi Package Installer, then the installer will download and install automatically...sounds easy! So lets do this. Simply click 'OK' and it will install. Note : the name of the file to be installed will probably be different from that listed above. On the source tab one can choose the type of video input. When operating on a minimal setup there is a option to use a webcam via video for GNU/Linux (v4l). You can also choose a DV input - this is useful for streaming live video from a hand held video camera. 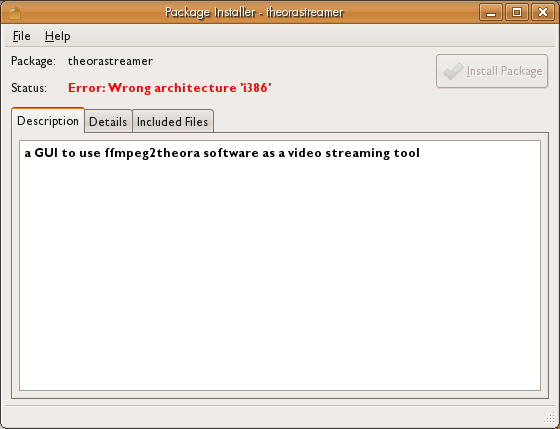 TSS also offers the possibility to stream an existing (archived) video file from your computer to an Icecast server. All fields in the ffmpeg2theroa encoding settings section must be completed. It is important we keep in mind that any information we enter here will have a direct influence on the final output bitrate of our stream. You cannot simply nominate an outgoing bitrate, rather the outgoing bitrate is based upon the choices you make about frame size, audio quality etc. Also, remember that the higher this bitrate is - the more bandwidth will be required to send it to the Icecast server, and the higher the bitrate the higher the bandwidth requirements of the audience connecting to your stream. So if some of our viewers are in Colombia where the average network connection is still around the 128kbps (kb/s or kbit/s is a unit of data transfer rate equal to 1,000 bits per second). This will mean that even though we have broadband connection sufficient to allow us to send a stream at a high resolution and high quality compression rate, we need to be careful to send a stream at a bitrate less than 128kpbs, otherwise few people in Colombia would be able to see it. Frame size: here we define the dimensions in pixels of the video stream. 320 by 240 has become a standard. For low bandwidth settings one might opt for 240 by 180. Frame rate: This setting defines the number of frames per second we want to transmit. Different events will require different frame rates. In the case of a conference, where the subjects don't move or change position too much, a 12fps (fps = frames per second) setting could be appropriate. In the example above we decided to sacrifice on the frame rate in favor for a bigger frame size. We selected 25:3 that will be around 8fps. Video Quality: This setting takes values in the range of 0 to 10. The default encoding quality for video of ffmpeg2theora is 5, one should use higher values for better quality. Audio Quality: This setting takes values in the range of -2 to 10. The encoding quality for audio defaults to: 1. Use higher values for better quality. Audio Channels: Sets the number of output audio channels. The choices are 0 (no sound), 1 (mono) or 2 (stereo). Audio samplerate: Expressed in Hz (Hertz) this box sets the output sample rate of the audio. 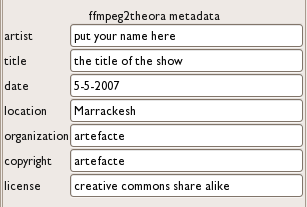 The information in the ffmpeg2theora metadata boxes is potentially available to your audience. Whether they can see the information depends on how they are viewing the stream (what player/browser) and if they know how to access this information. You can enter any information here, it doesn't matter - ignore the categories (location, date etc) if you want to. The icecast server settings and icecast metadata entry boxes are next. In the icecast server settings we have to define the address (URL) of the streaming server, the port this server is using (usually 8000), the name of our mountpoint (channel), and the password. If you lack access to an icecast server there are few free projects out there dedicated to assisting people to stream using free software, check on estudiolivre.org or GISS.tv to name a few. The icecast metadata settings is simply where you put information about your stream that you want the audience to know. This information will be displayed on the servers webpage (each Icecast server installation has its own webpage). Although they have specific titles you can put any information in here, it doesn't matter. The last tab has the title preview. If you check enable preview window you will see a preview of the live stream as you encode it. This video is not the same as the video coming from the Icecast Server, so it always pays to monitor both the preview and the stream coming from the server (monitor the incoming stream on another computer). If you wish to send one stream you need only pay attention to the settings in the Source and target1 tabs. If you wish to send two streams you have to pay attention to the settings in target2 as well. Once you have specified all the required information for each of the outgoing streams and have connected the correct video source (or you have chosen a working video file to stream) then you just press 'Execute' and the streaming should begin!